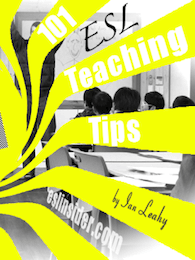 101 ESL Teaching Tips is a collection of teaching tips devoted to teaching English language learners. Some of these tips not only concern TEFL, but such things as public speaking, how to use your body in the classroom, how to deal with students who don't want to learn, how to best use your voice, appropriate ways of correcting your students, classroom management and more. Some of these tips are geared more towards teaching children. You can get the first few teaching tips FREE. Buy 101 Teaching Tips For ESL Teachers on Amazon for $2.99. Or you can also rent and listen to it on video for $1.99.